Today I have some VERY exciting news: I am in the October issue of the national magazine Latina! 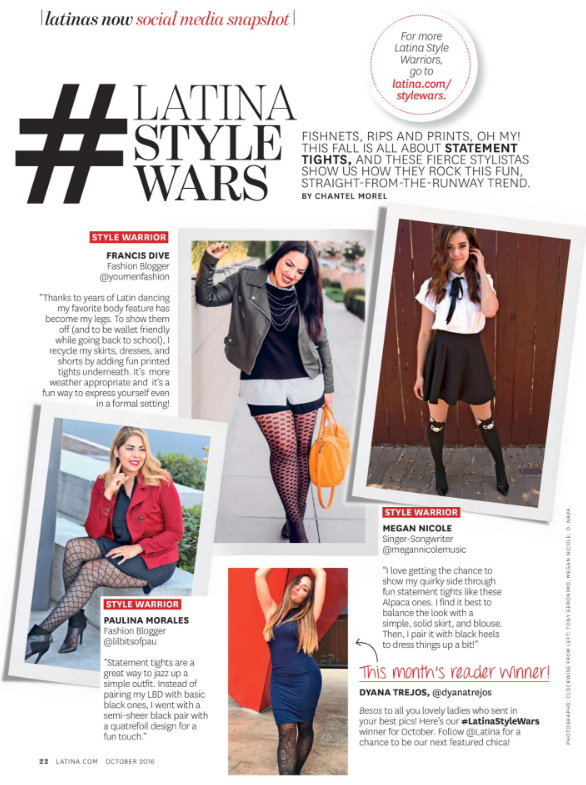 You can find me in the #LatinaStyleWars section on page 22 talking about how I style statement tights! When Latina Magazine reached out to me for this feature (first I jumped up and down because I grew up reading Latina Magazine #dreamcometrue) and then so many ideas flowed through my head (i.e. floral tights, dotted tights, colored tights) so I ran off to Target to see what I could find. I stumbled upon these unique patterned tights that I knew would go well with an LBD or a black skirt. I wasn't really digging the look being all black so I tossed on my fave blazer at the moment, this red outing blazer from cabi which instantly added the fall vibes to it. The October 2016 issue cover with the inspiring Gina Rodrigues! Make sure you grab your copy or download the digital issue in the Latina App. Pick up the October issue in newsstands now, or the digital issue on the Latina app! Muchas Felicidades Pau. I'm so happy for you, may I have your autograph lol. You have been an inspiration of mine so thank you for always representing us Latinas the way you have.